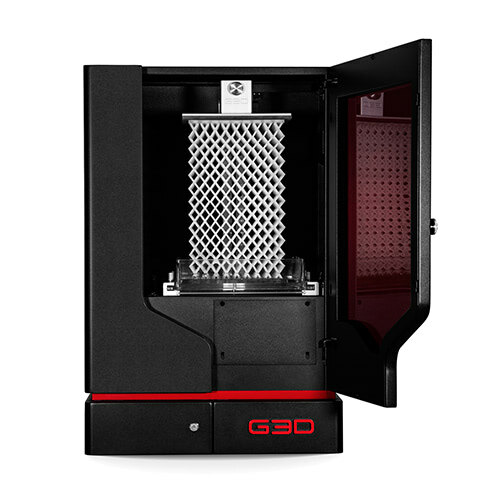 The G3D T-1000 is a DLP 3D printer capable of printing very detailed parts. A customized stepper motor and a specialized Acme thread result in an extremely high resolution (7.5 Microns z-layer height). Besides high detailed parts the T-1000 is also capable of printing big objects with its 179.2 x 134.4 x 300 mm / 7.06 x 5.29 x 11.81 inches print size. Bought my T-1000 a few months ago. Needed the large volume for my projects. The speed at which i can print large models is remarkable! Not regreting my purchase at all. Does it need a UV curing chamber?